Senior PA official reveals that Israel has told PA it will not release last batch of terrorists on Saturday. A senior Palestinian Authority (PA) official announced Friday that Israel has told the PA it will not go through on the fourth and final batch of terrorist releases, which was set for Saturday night. "The Israeli government has informed us through the American mediator that it will not abide with its commitment to release the fourth batch of Palestinian prisoners scheduled for tomorrow, Saturday 29," PA official Jibril Rajoub told AFP. "Israel has refused to commit to the names that were agreed upon of prisoners held by Israel since before the 1993 Oslo agreements," added Rajoub, calling the move a "slap in the face of the US administration and its efforts." Rajoub reiterated PA threats to take unilateral moves for recognition at the UN next week, in breach of conditions of the peace talks, due to the release not occurring. "Not releasing the prisoners will mark the beginning of the efforts in the international community to challenge the legality of the occupation," threatened the PA official. 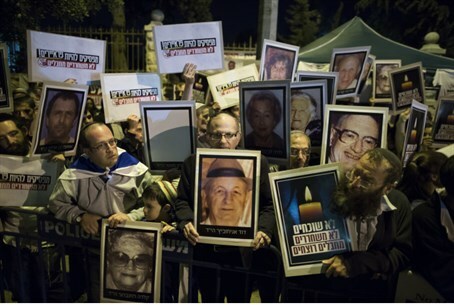 The release, intended as a "gesture" to promote the stalled peace talks, has been widely protested in Israel. Deputy Defense Minister Danny Danon threatened to resign if the move went through. So far Israel has released 78 of the promised 104 terrorists; many of the terrorists were convicted of murdering Israeli citizens. PA Chairman Mahmoud Abbas has set the terrorist release, as well as a construction freeze in Judea and Samaria, as a condition for continued talks. Abbas has brought talks to a loggerhead by refusing to recognize Israel as a Jewish state. Rajoub back in February said “if the talks fail, armed struggle against [Israel] could be a strategic solution for the Palestinian people,” emphasizing that Palestinian terrorist groups “never abandoned the solution of an armed uprising.” The calls for renewed terrorism have been increasing lately in PA, and Abbas's Fatah movement.